I also posted a list of what I was hoping to read over the summer vacation. I was less ambitious than Mr. Gette, so I only chose 12 Calarco Library-owned books (I read other books that were separate from the list). Let the Great World Spin by Colum McCann. Why did it take me so long to read this book?! A must read in the modern-novel genre. Feed by M.T. Anderson. I originally rated this as a 3 star book, but as time passed, the book creeped into my list of all-time favorites. Published in 2000, this satirical YA book can also be read as a cautionary tale. Read it in one sitting. The Bees by Laline Paull. Allegories everywhere. Reading about a beehive society from the point of view of a bee was exactly as interesting as I expected. Attachments by Rainbow Rowell. Be still my heart, Rainbow Rowell. A good story that can easily be read in a day or two. Annihilation by Jeff VanderMeer. I didn’t get anything out of this book, but I will give it 2 stars. The writing was technically excellent and other reviewers swear by this book. Although Mr. Gette and I missed the boat on this one, maybe others will love the Southern Reach Trilogy. So there it is. Although I read other books on my non-Calarco list, I was definitely hoping to read more than 6 off of this list. Want to share what you read? Want to disagree with my commentary? Leave us a comment below! This entry was posted in e-Readers, Reader Advisory, Reading and tagged Books, Kindles, Reading, summer reading on September 24, 2014 by Jenny Nicolelli. Last May, I posted a list of what I planned to read over the summer. 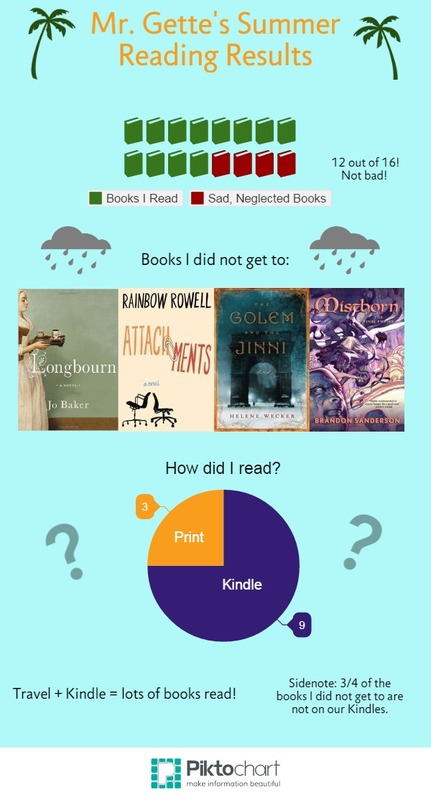 There were 16 books total on the list – ambitious, considering that I only listed books owned by the Calarco Library, and there were other books I planned to read as well. The Goblin Emperor, by Katherine Addison. I want a sequel! Ancillary Justice, by Ann Leckie. The sequel comes out in October! The Ocean at the End of the Lane by Neil Gaiman. This book will make you wish you could remember how you saw the world at 7. Death of a Dyer, by Eleanor Kuhns. I got to the last page and immediately bought the third book. A solid historical mystery. We Are All Completely Beside Ourselves, by Karen Joy Fowler. See! I read/like contemporary fiction. Smart, fun, and funny. Afterparty, by Daryl Gregory. Cool world-building, great characters. Bellfield Hall, by Anna Dean. A perfectly serviceable mystery. Company of Liars, by Karen Maitland. This would have been a 4 star book if it wasn’t for the last chapter. A creepy Canterbury Tales. Vicious, by V. E. Schwab. Superpowers but no heroes. Charm and Strange, by Stephanie Kuehn. A good book in a lot of ways, but it didn’t work for me. Dark. Winger, by Andrew Smith. Winger, you betrayed me. You were supposed to be a light, funny read after Charm and Strange. And let’s just say that didn’t work out. Annihilation, by Jeff Vandermeer. I should have expected this book would get really weird. So there you have it. Another summer of books accounted for. Want to talk about what you read? Defend a book I didn’t like? Leave us a comment! This entry was posted in Librarians, Reader Advisory, Reading and tagged summer reading on September 24, 2014 by Mr. Gette. Hello everyone, and welcome back: to Hopkins, to the library, and to the Calarco Library Blog! In the coming days we’ll be filling you in on what we read this summer, but we wanted to kick things off with what you read this summer! As you know, the librarians sent out a summer reading survey to the whole school, asking you to pick one book out of everything you read this summer – required or not – as your very favorite. We received about 300 responses from students, faculty, and staff, which proves just how much you like reading. Or us. Or how accustomed you are to filling out surveys. To misquote one of this summer’s favorite reads: all books are popular, but some books are more popular than others. By far and away the most favored book was The Fault in Our Stars, by John Green (you can read our review of TFIOS here). Fifteen people (14 students and 1 faculty member) said that it was their favorite book they read this summer. John Green was more widely popular as well: seven students said Looking For Alaska was their favorite summer read, two preferred Paper Towns, and one discerning individual liked An Abundance of Katherines best. And two students simply answered “John Green.” Overall, that’s 27 members of the Hopkins Community who liked a book by John Green best. George Orwell also had a good summer: both 1984 and Animal Farm were beloved by 5 respondents. Also in the “five people love me” category are Water for Elephants, by Sara Gruen, and If I Stay, by Gayle Foreman, which may have gotten a boost from the August release of a movie version. And rounding it off with three votes apiece were And Then There Were None, by Agatha Christie; The Goldfinch, by Donna Tartt; Into Thin Air, by Jon Krakauer; The Help by Kathryn Stockett; The Killer Angels, by Michael Shaara; On the Beach, by Nevil Shute, and To Kill a Mockingbird, by Harper Lee. Although the survey reveals which books were most popular this summer, it also demonstrates the enormous variety of interests and tastes that illustrate the Hopkins community. For example, the Class of 2015 read non-fiction survivalist memoirs (Into Thin Air, Alive, Unbroken), “young adult” fiction (Every Day, Harry Potter and the Sorcerer’s Stone, Eleanor and Park), classic novels (Catch-22, Journey to the Center of the Earth, The Sun Also Rises), modern fiction (Little Bee, The Goldfinch, Hologram for a King) and a slew of other styles and genres. The trend permeates every class and is best reflected in the faculty and staff respondents. Is anyone surprised that the Faculty/Staff group (almost) did not list a single repeating title as a favorite? So, Variety – check. Summer Favorites – Check. What does this mean? Looking at the respondent totals, the most interesting observation we can glean is that reading tastes overlap, despite enormous age gaps. Yes, 15 respondents like The Fault in Our Stars best. No, they were not all Junior Schoolers – every group had at least one TFIOS fan. Was TFIOS the only “age barrier breaking book”? Definitely not. Let’s be honest, we librarians were moderately thrilled (or enthusiastically fist pumping) when we saw that 300 people responded to our survey. The moderate or wild celebration only continued when we realized how many people read multiple books this summer and how well our current collection matches what Hopkins loves to read. Whether or not you took the survey, please check out the final fact-spread. Don’t see any of your favorites? Interested in reading a book that we don’t have? Please let us know if there is a book you want to read or you think we should own. The Calarco Library takes book requests and also downloads on-demand titles to our Kindles (see the full Kindle Book List here). This entry was posted in Reader Advisory, Reading and tagged Books, Reading, summer reading on September 11, 2014 by Jenny Nicolelli.